Nowadays the official E8-trail covers sections in nine countries,and two more countries to be developped. Here below is a short introduction into the details of the E8. The Irish section starts nowadays in the far southwest corner of the Island, at Duresey Head. This is where the only cablecar in the country crosses the Dursey Pont to Dursey Island. If you want to start the E8 really on the furthest location you take the cable car to the Island, and then cross Dursey Island (some 8km to walk) down to the southwest tip where you are surrounded by the Atlantic. At the time Ireland was integrated into the E8 the start was situated on Valentia Island, west of Caherciveen (Kerry). Dursey Head is one peninsula further to the south. From Dursey Head the E8 follows a string of local hiking trails: Beara Way, Kerry Way, Duhallow Way, Avondhu Way, Munster Way, South Leinster Way and finally the Wicklow Way to Dublin. From Dublin the ferry brings the hikers across the Irish Sea to Liverpool. 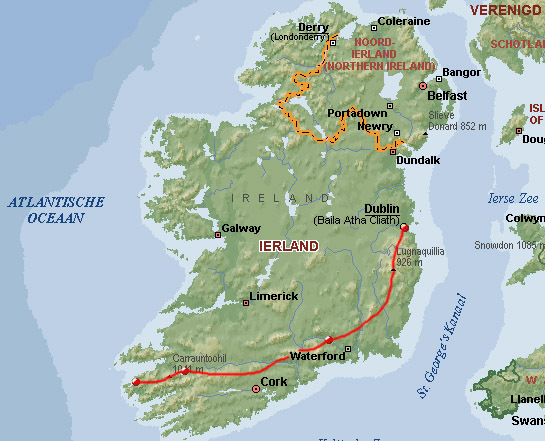 The Irish section covers approximately 650 kilometers. From the terminal in Liverpool the E8 follows more or less the Penine Trail to Kingston-upon-Hull. From Hull the ferry takes the hikers to Europoort, which is the Northsea harbour of Rotterdam. The English coast-to-coast section covers approximately 300 kilometers. Nowadays the E8 starts at Europoort, and follows the local hiking trails Oeverloperpad and Lingepad. 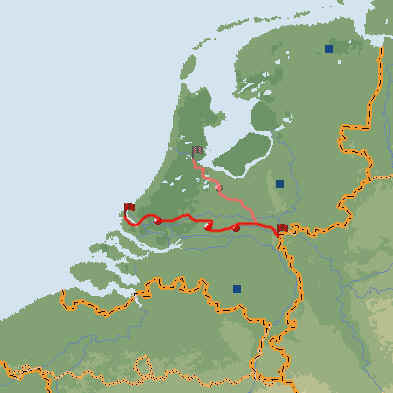 These trails, covering approximately 240 kilometers, follow the river Rhein upstream crossing the country to the German border, east of the city of Nijmegen. At the time the E8 was originally mapped the starting point of the E8 was Amsterdam. From the Central Railwaystation the hiker was led to the southeast, to the Rhein, and consequently to Nijmegen. I have hiked this section of the E8 between January 1994 and December 1995. The German section crosses first the Niederrhein region, to the city of Aachen. From there it crosses the typical Eifel-hills to Bonn, where the E8 meets the river Rhein again. The Rhein is more or less the guide for the direction of the E8 in the next 265 kilometers, to the city of Worms. There the hikers cross the ancient Nibbelungenbridge, and head towards the river Main, and afterwards to the river Tauber, the river Altmühl to meet the river Danube near the Bavarian city of Regensburg. After crossing the Bavarian Forrest the Austrian border is reached east of the city of Passau. 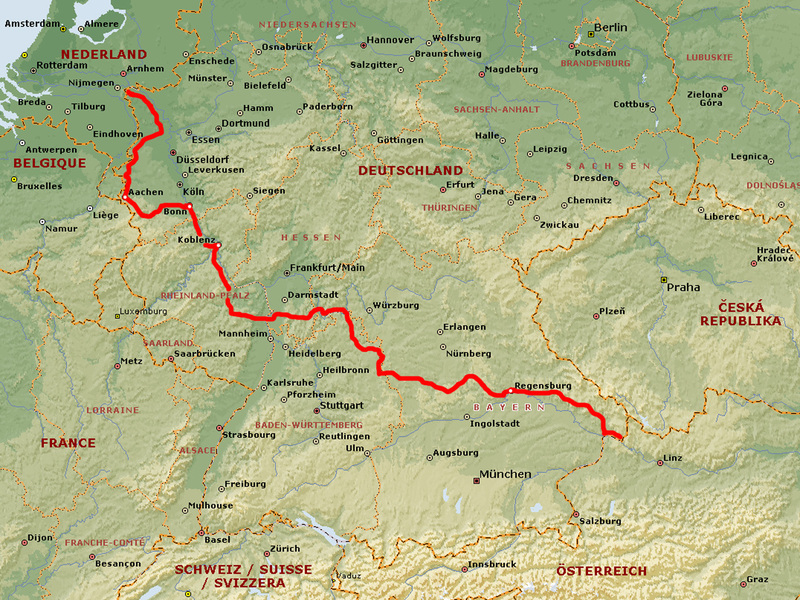 I have hiked the German section of the E8, that covers 1380 kilometers, between December 1995 and October 2003. Although the E8-trail passes through Passau and leads to Vienna, it does not follow the very wellknown Danube-way. This very popular way is used by many hikers and cyclists to cover this wonderfull part of Europe. The E8 follows local hiking trails that lead close to the Czech border, through hills and along rivers, to the Austrian capitol Vienna. Along the Danube river the E8 passes Vienna and continues to Slovakia. The Austrian section covers 495 kilometers. I have hiked these between October 2003 and November 2005. In the far southwest corner of Slovakia the E8 enters the country, in the capitol Bratislava. From there the E8 follows the national hiking trail SNF to the Polish border in the northeast, at the historical Dukla Pass. Along the trail many isolated area’s are crossed, as well as historical cities and also the highest point of the E8: the top of the Lower Tatra Mountains at 2000 meters altitude. The Slovakian section of the E8 covers 690 kilometers, which I have hiked between November 2005 and June 2013. During many years of outdoor activities I have never smelled such clean air as in many stages in Slovakia. The Polish section is small, but remarkable. It starts near the village of Barwinek, and it leads through isolated hills to the far southeast border with Ukraine, near the village of Wolosate. There, at the Beskiden Pass, the signs of the E8 come to an end. The Polish section covers approximately 210 kilometers, and I have hiked these between June 2013 and April 2014. From the Beskiden Pass the E8-trail is supposed to continue southeast/south-bound, following the Carpatian Hills to the border with Rumania. This part of the E8 is not devlopped, mapped and signed yet. Perhaps that’s a nice challenge for me, for a future hiking adventure? The Rumainian section of the E8 is also not developped, mapped and signed. In general the E8 follows the Carpatian Hills southeast and later westbound to arrive at the Bulgarian border in the west of the country. The Rumanian section is supposed to cover approximately 1300 kilometers. From the Rumanian border the E8-Trail goes south and later eastbound to the Turkish border. Some stages of the Bulagrian section have been mapped and signed. The complete Bulgarian section covers approximately 450 kilometers. From the Bulgarian border the E8-Trail goes more or less straight to Istanbul where, on the European banks of the Bosporus, the Trail ends. Istanbul is not the goal of the E8, it is only the finish. The goal of the E8 is to enjoy discovering the world, its nature, its people and its diversity.